Heirloom vegetables are the staples in our kitchen garden with an array of different colors, like purple beans, red okra, white eggplant and a variety colorful tomatoes. All these add to the interest of the kitchen garden. Because our garden is front and center and used as a demo garden as well for classes we are always looking for ways to enhance its beauty without sacrificing production. 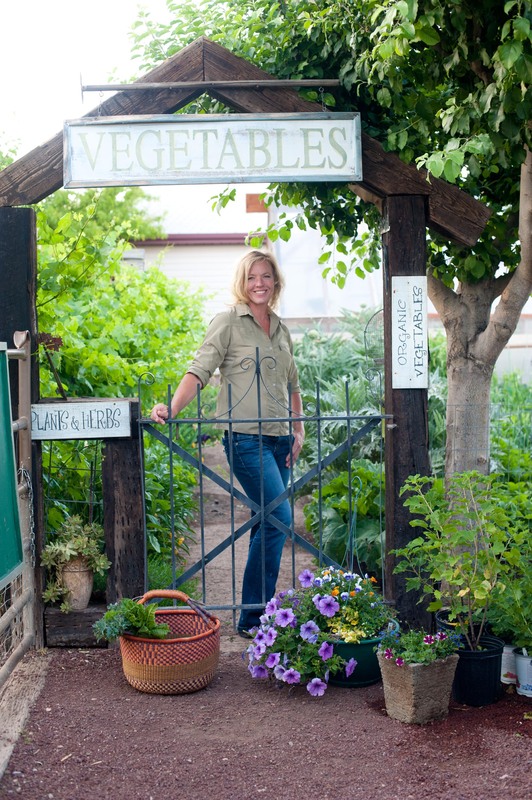 Here’s 8 practical and pleasing tricks to try in your kitchen garden. 1. Growing a few vibrantly colored vegetables can punctuate expanses of green in the garden. The deep purple pods of peas and beans will stop you in your tracks. Burgundy bean for summer time and Blauwschokkers pea spring are my favorites. Listada eggplants are beautifully stripped and prolific making them a perfect summer time eye-catch! 2. When placing plants, be sure there’s a method to your mixture. Vegetables are typically grown in rows of a single variety, which makes spacing easy, simplifies cultivation, and keeps the garden looking tidy, but by mixing rows of color, texture, and form will create a tapestry pleasing to the eye. Such as planting a row of green and red leaf lettuce, green heading lettuce, the red and frilly ‘Lollo Rossa” lettuce, Ruby Red Chard and Purple Kohlrabi all work great together and look amazing. 3. Painted stakes lend an artistic touch and last longer. Since plant supports are going to be seen, why not make them attractive? 1×1 stakes can be cut all the same length, then painted a soothing blue-green or a flashy color if you like. Stake them into the ground to the same height. This visual uniformity helps keep the tomato patch looking good. The paint also prolongs the life of the stake a bit. Over time, as the bottoms rot, they can be sawn off cleanly and the stakes reassigned to shorter plants, like peppers. 4. Don’t hesitate to tuck flowers right in among the vegetables. A beautiful combination of purple violas with red cabbage are dynamite together. The purple flowers of the viola pick up the reddish-purple veins in the cabbage leaves. Plus violas are edible! 5. Nothing beats fresh produce simply prepared. Just minutes after picking, fava beans return to the garden, lightly steamed, and drizzled with olive oil, pesto, and balsamic vinegar. The pesto made in a blender while the fava beans steamed. Enjoying a meal surrounded by the beautiful garden that produced it is the best seasoning of all. A little bistro table tucked in the garden makes a great spot for this simple garden dish to be enjoyed. 6. Tiles make long-lasting plant markers. In a garden with so many unusual varieties and so many curious visitors, easy-to read plant markers are a real plus. Terra-cotta tiles, which are inexpensive, good looking, and will last indefinitely if not left out over winter. 7. Raffia, hemp and Jute is a natural for tying up plants. It’s unobtrusive, strong, flexible, inexpensive, and will last the season. And come fall, they can go right in the compost with the spent plant. 8. Bamboo makes a great natural fence or pea trellis. By crisscrossing bamboo, you can grow peas up it making a living fence or adding this crisscrossed bamboo on an edge where vegetable bushes like to fall over beds into paths, will tidy up paths, keeping plants in place. All good ideas. I have Listada eggplants in the potager for the first time, and love them. Purple beans are a must, as are red cabbages. Orange is my happy color, so there are lots of orange peppers, orange swiss chard, and orange tomatoes. I’ll definitely paint my stakes this fall so they will be ready for next year!